WITH THAT IN MIND, WE DESIGNED THE ADAFRUIT CRICKIT HAT - THAT'S OUR CREATIVE ROBOTICS & INTERACTIVE CONSTRUCTION KIT. IT'S AN ADD-ON TO THE RASPBERRY PI THAT LETS YOU #MAKEROBOTFRIEND USING PYTHON! 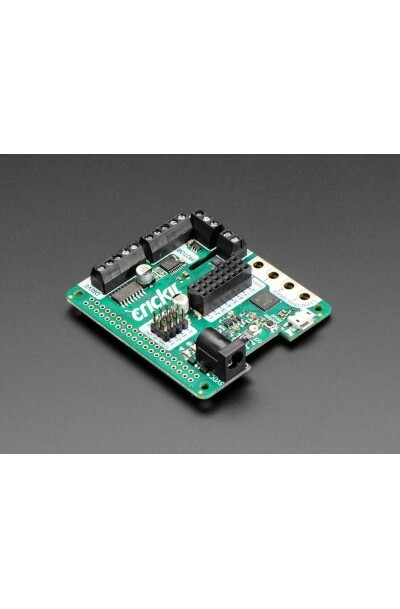 PLUG THE CRICKIT HAT ONTO YOUR PI USING THE STANDARD 2X20 GPIO CONNECTOR AND START CONTROLLING MOTORS, SERVOS, SOLENOIDS. YOU ALSO GET 8 SIGNAL PINS WITH ANALOG INPUTS OR PWM OUTPUTS, CAPACITIVE TOUCH SENSORS, A LEVEL-SHIFTED NEOPIXEL DRIVER AND 3W AMPLIFIED SPEAKER OUTPUT FROM THE I2S PORT. IT COMPLEMENTS & EXTENDS YOUR PI, DOING ALL THE THINGS A PI CAN'T DO, SO YOU CAN STILL USE ALL THE GOODIES ON THE PI LIKE VIDEO, CAMERA, INTERNET, BLUETOOTH... BUT NOW YOU HAVE A ROBOTICS PLAYGROUND AS WELL. CONTROL OF THE MOTORS, SENSORS, NEOPIXELS, CAPACITIVE TOUCH, ETC IS ALL DONE IN PYTHON 3. IT'S THE EASIEST AND BEST WAY TO PROGRAM YOUR PI, AND AFTER A COUPLE PIP INSTALLS YOU'LL BE READY TO GO. AUDIO IS HANDLED BY THE PI'S BUILT IN AUDIO SYSTEM, SO ANYTHING THAT PLAYS AUDIO WILL COME OUT THE SPEAKER - THAT INCLUDES PYTHON COMMANDS OR ANY APPLICATION WITH SOUND. 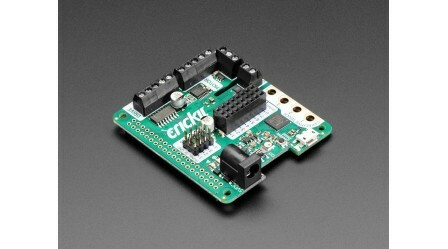 THE CRICKIT HAT IS POWERED BY SEESAW, OUR I2C-TO-WHATEVER BRIDGE FIRMWARE. SO YOU ONLY NEED TO USE TWO DATA PINS TO CONTROL THE HUGE NUMBER OF INPUTS AND OUTPUTS ON THE CRICKIT. ALL THOSE TIMERS, PWMS, NEOPIXELS, SENSORS ARE OFFLOADED TO THE CO-PROCESSOR. 1 X NEOPIXEL DRIVER WITH 5V LEVEL SHIFTER - THIS IS CONNECTED TO THE SEESAW CHIP, NOT THE RASPBERRY PI, SO YOU WON'T BE GIVING UP PIN 18. IT CAN DRIVE OVER 100 PIXELS. 1 X CLASS D, 4-8 OHM SPEAKER, 3W-MAX AUDIO AMPLIFIER - THIS IS CONNECTED TO THE I2S PINS ON THE RASPBERRY PI FOR HIGH QUALITY DIGITAL AUDIO. WORKS ON ANY PI, EVEN ZERO'S THAT DON'T HAVE AN AUDIO JACK! BUILT-IN USB TO SERIAL CONVERTER. THE USB PORT ON THE HAT CAN BE USED TO UPDATE THE SEESAW FIRMWARE ON THE CRICKIT, OR YOU CAN PLUG INTO YOUR COMPUTER, IT WILL ALSO ACT AS A USB CONVERTER FOR LOGGING INTO THE CONSOLE AND RUNNING COMMAND LINES ON THE PI. PLEASE NOTE THIS BOARD DOES NOT REQUIRE ANY SOLDERING BUT YOU WILL NEED A 5V POWER SUPPLY AND A RASPBERRY PI TO GO ALONG WITH THE CRICKIT, AND THESE ARE NOT INCLUDED!